Not a childhood one but see Jean Bruce (and father) and then be sure to click on THIS LINK as the link at the foot of the BBC page is now defunct (2018). The BBC People's War site still exists but no longer has a search box. The main "contents" list of Malta stories HERE does not find them all (and not those posted above). 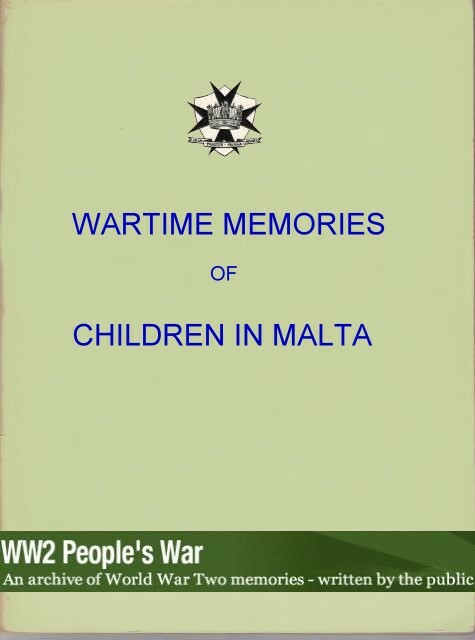 But Googling "BBC People's War Malta" gives lots of hits not shown in the main Malta category. Clare Gibson's book ARMY CHILDHOOD: BRITISH ARMY CHILDREN’S LIVES AND TIMES A book by The Army Children Archive’s founder, Clare Gibson, was published by Shire Publications Ltd in 2012. See HERE (scroll down a bit).